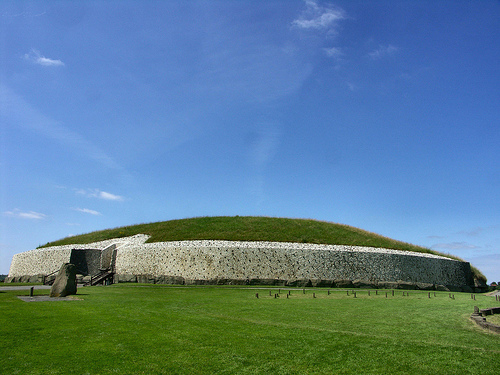 The passage tomb at Newgrange is probably Ireland’s most iconic archaeological site and it is indelibly linked with the winter solstice. The tomb itself is over 5000 years old, pre-dating the first phase of Stonehenge by 1000 years and the Egyptian pyramids by 400 years. It is roughly circular in plan and contains an east-facing passageway, 19m long, which leads into a central chamber that contains three recesses or small rooms. The tomb is a massive structure measuring 76m in diameter by 12m in height and it contains over 200,000 tonnes of earth and stone in its fabric. 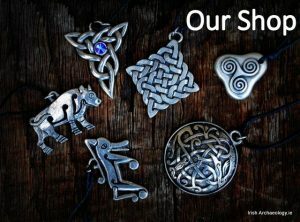 It was a monumental feat of engineering in a time pre-dating metal tools and it must have taken many years to complete. Archaeological excavations carried out by M. J. O’ Kelly revealed the bones of at least five people, some cremated and some un-burnt, within the central chamber and recesses. 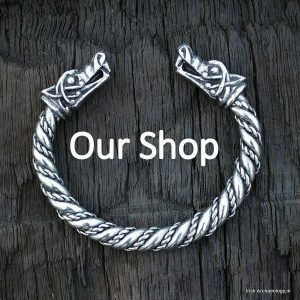 However, originally there may have been more burials as Newgrange has been open to the public since the late 17th century and has been much disturbed since then. 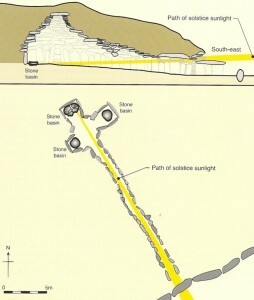 Either way these internments demonstrate that Newgrange was, at least on one level, a tomb for the dead. The structure is also notable for the extensive use of rock art in its build, especially in the surrounding kerbstones and along the orthostats that define its passageway and inner chambers. A variety of abstract images are used including spirals, lozenges chevrons, dot and circle, and pecking. Although the original meaning of these motifs remains unknown they probably played an important role in the ceremonies carried out at the tomb. However, it is not its size, though impressive, nor the beautiful artwork that adorns so many of its stones, that Newgrange is probably most famous for, but instead its association with the winter solstice. This date marks the shortest day of the year and it appears to have been a time of special significance for the people who built Newgrange. Indeed, the whole monument was designed around capturing the first rays of sunshine on the morning of the solstice. Due to the natural slope of the ground the floor of the passageway at Newgrange rises gradually as you journey from the entrance to the inner burial chamber. This means that the floor of the burial chamber is actually 2m higher than the floor at the entrance. As a result no light can reach the inner recesses of the tomb, which remain in nearly total darkness for most of the year. However on the 21st of December something very special occurs (and a number of days either side). As the sun rises above the eastern horizon a single beam of sunlight creeps slowly up along the tomb’s passageway until it reaches the dark confines of the burial chamber. The near perpetual darkness is broken and the inner and most sacred confines of this ancient tomb are, for short time, illuminated. To ensure this solstice event occurred the tomb builders had to construct a special ‘roof box’ above the passageway. This was located roughly 2.5m in from the entrance and was in essence a stone lined window measuring measured c. 1m wide by 0.60m high. The extra height provided by the ‘roof box’ allowed the sun’s rays to reach the very back of the tomb. The entire monument is modelled around this single beam of light and considerable planning must have gone into working out the exact time and angle of the solstice sunrise and how to capture its rays for maximum effect. 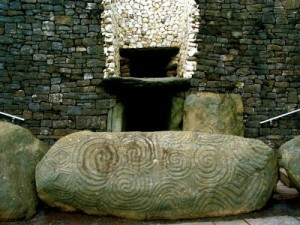 The winter solstice was obviously an incredibly important date for the builders of Newgrange. It marked the end of the old year and the start of the new one. It was a significant moment in the farming calendar, from that day on the days would gradually grow longer and eventually warmer. Moreover, it may also have symbolically marked an important moment in the human life cycle. It is hard not see parallels with the old sun ‘dying’ on this day and the new one being ‘born anew’ and a human belief system based on the principle that people would similarly be reborn when they died. 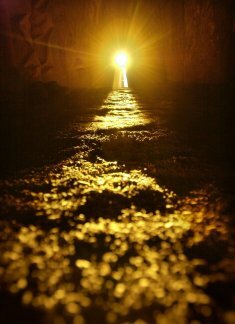 Today we can only speculate on why the builders of Newgrange put such emphasis on the winter solstice sunrise. However, there is no denying that 5000 years later there is still a sense of magic and wonderment when the darkest recesses of Newgrange light up on the 21st of December. Stout, G. & Stout, M. 2008, Newgrange, Cork University Press, Cork. That looks like a womb to me? The joining of the divine male and fe-male and the creation of the 3rd being. Bru = womb of course. 13 moonstones confirm the ancient law of natural time before the Gregorian calendar. Interesting, any more on this? Hopefully i will be there next Monday with my family as we go every year. Its a wonderful place to be. Its a very nice gathering of people to share the same space as the people who stood there 5000 or more years ago and hope for a new year ahead . Thanks to Doctor O Kelly and people like him that we have this for generations to come.